Head To Head – Cheetah vs. Formula E Race Car! Must See! We have been through many amazing racing videos over the last couple of years and seen some incredible duels, but what you are about to see in the next video tops them all. Namely, in the world of vehicles you can expect everything, but would it better if you place them head to head versus animals? Well, sure it is and in this video presented by Eurosport, a Formula E Race car goes head to head versus a cheetah. Yes, you heard it right. People actually took their time and made this video possible. But what do some of the numbers say just seconds before the race? It seems that it is going to be a tough one hence both the cheetah and the Formula E Race car go from 0 to 60 in exactly 3 seconds. Once everything was nice and ready, both of the racing units were off to a furious start. The cheetah took the lead at the start and was holding up just fine throughout the whole race. 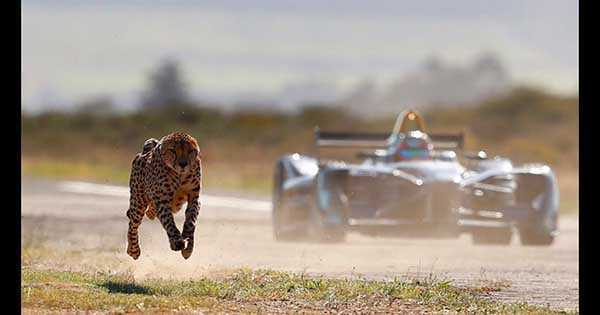 But then, just inches from the finish line, the Formula E Race car managed to get past the cheetah, thus eventually winning this intense and tight race. This was an awesome commercial made especially for the brand-new Formula E season that starts this weekend in Hong Kong. The video is indeed one of the most beautiful and one of a kind that we have lately seen. What do you think about it? Finally, read more about this marvelous creature here!